Sure Medical Care (Elmhurst) - Book Appointment Online! 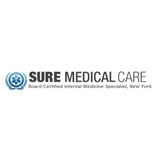 Board Certified Internal Medicine Specialist Sure Medical Care - New York We offer a full array of preventative services from cholesterol and cancer screening to heart and bone scans. Our goal is to keep you healthy! Internal Medicine is a branch and specialty of medicine concerning the prevention, diagnosis & non-surgical treatment of diseases in adults from teen through old age. Please click to make an appointment with us today!